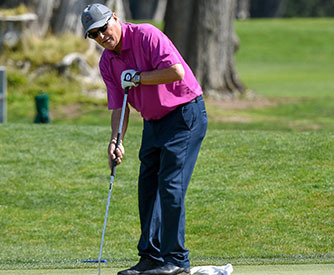 In Northern California senior golf, Jim Knoll is the glue that holds this community together. Knoll loves the competition – and the camaraderie that goes with it – so much that he’s taken to spreading the word about different events throughout the year. “It’s a labor of love,” Knoll said of the email communication he spearheads among a group of roughly 200 senior amateur golfers. It keeps the group together, and it keeps them interested in golf. On Sunday, it was fitting that Knoll was the last senior standing at the San Francisco City Championship at TPC Harding Park. Knoll, who has remained competitive on different levels throughout his life, last won the senior division of this event in 2008. It was the first time he competed in the City as a senior and now eleven years later, he is back on top. At 66 years old – and in the kind of dicey weather that a San Francisco spring can throw at you – that’s significant. Knoll is that sort of ever-positive player, in golf and in life. When stroke-play qualifying began for the City on March 5 – followed the next day by the first round of match play – it was a cold, soggy affair. Knoll calls that element the “mystique” of this tournament. The reinstated amateur, who first played this event as an 18-year-old in 1970, tapped into patience and experience to get through the early part of the event. Organization and good will aside, Knoll is a Northern California legend in his own right. He is a five-time NCGA Senior Player of the Year. To win his second City title, Knoll also had to get through some tough matches late in the tournament. He met NCGA Hall of Famer Randy Haag in the semifinals, winning 5 and 4, then faced off against Scott Schroeder in the championship match. Knoll and Schroeder have known each other for nearly half a century. On Sunday, the title came down to the final hole, where Knoll made a 12-footer and Schroeder missed a 10-footer. The San Francisco City Championship is something of a kickoff for golf in Northern California, and competition will ramp up in the following weeks. Count on Knoll being at the heart of it. In the super senior division, Frank Pieper met Stuart Francis in the championship match and came out ahead, 5 and 3. Pieper hails from Carmel, Calif., and advanced through the bracket as the No. 4 seed. $225 ENTRY FEE INCLUDES ALL GREEN FEES. Open to the first 110 entries received. Participants must have an index of 9.4 or lower as of December 1 and must have an age of 55 or older as of the first day of the tournament. Qualifying will consist of one 18-hole stroke play round, from which the low 32 scores will advance to the Men’s Senior Championship Flight. Individual scores will determine seeding for match play. There will be no refunds after entries close. All rounds will be played at TPC Harding Park Golf Course. *In the event of a playoff for match play a player must be present in order to retain his right to participate in the playoff. A schedule of all dates of play can be found on the tournament website sfgolfchampionship.com.